Navigate to the Category Manager. To add a new Category, press the 'New' icon in the toolbar. To edit an existing Category, click on the Category title or click the Category's checkbox and then click on the Edit icon in the toolbar. This is where you can add a new Category to a Section or edit an existing Category. Categories are used to organize the Articles within a Section. Sections and Categories allow you to display related Articles together on a page and to filter Articles in the Article Manager. All Articles are assigned either to a Category that you create or to the special Category called 'Uncategorized'. Section. Section for this Category. Select the Section from the drop-down list box. This is a required field. Category Order. The order this Category will display in the Category Manager. Use the drop-down list box to change the Order. You can select 'First' or 'Last' to make this the first or last Category. You can also select a Category from the list. In this case, the current Category will be listed just after the Category you select. Note that the Order can also be changed in the Category Manager screen. Image Position. Position of the Image on the page. Select Left or Right from the drop-down list box. Description. The description for the item. Section and Category descriptions for Articles may be shown on web pages, depending on the parameter settings. These descriptions are entered using the same editor that is used for Articles. Note that Section and Category descriptions may not be edited from the front end. <translate> The default editor for both front-end and back-end users in Joomla! is the TinyMCE editor. Top Row - Menu - You will find here Menus offering various features and often complementary to those in the buttons below. Tools: Edit Source Code. A popup displays, showing the HTML source code, allowing you to edit the HTML source code. Buttons on the left allow you to make text bold, italic, underlined, or strikethrough. Next to that are buttons for align left, center, right and full. Paragraph. 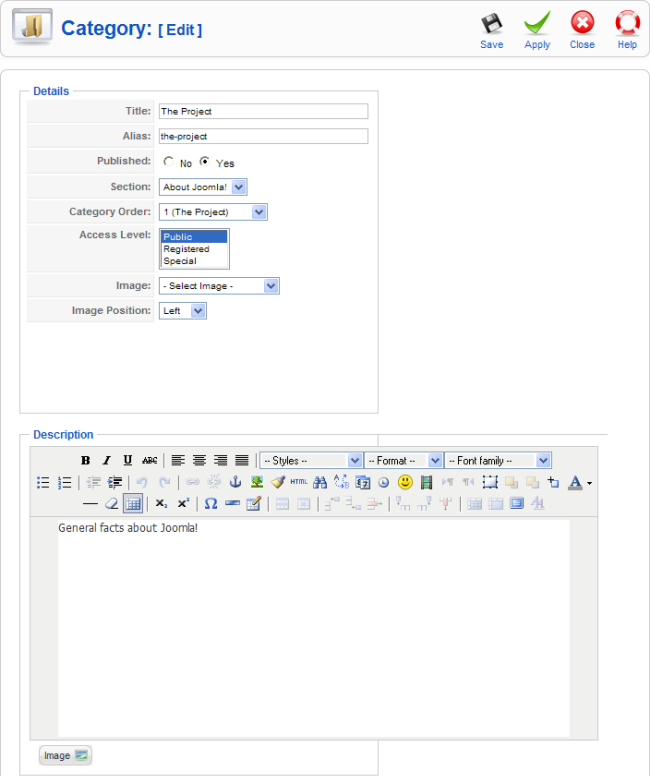 Select pre-defined formats for Paragraph, Address, Heading 1, and so on. List where you can choose between Bullet list or Numbered list. Insert/Edit Link. To insert or edit a link, select the linked text and press this button. A popup dialog displays that lets you enter details about the link. Remove link. To remove a link, highlight the linked text and press this button. Insert/Edit Image. To insert an image, place the cursor in the desired location and press this button. A popup dialog displays that lets you enter in the Image URL and other information about how the image will display. Source code. A popup displays showing the HTML source code, allowing you to edit the HTML source code. Horizontal line. To insert a line. Table, to insert a new table, Table Cell Properties, Insert Row Before, Insert Row After, Delete Row, Insert Column Before, Insert Column After, Delete Column, Split Merged Table Cells, Merge Table Cells. Subscript, Superscript, Insert Custom Character. Directory. The current directory on the host server. 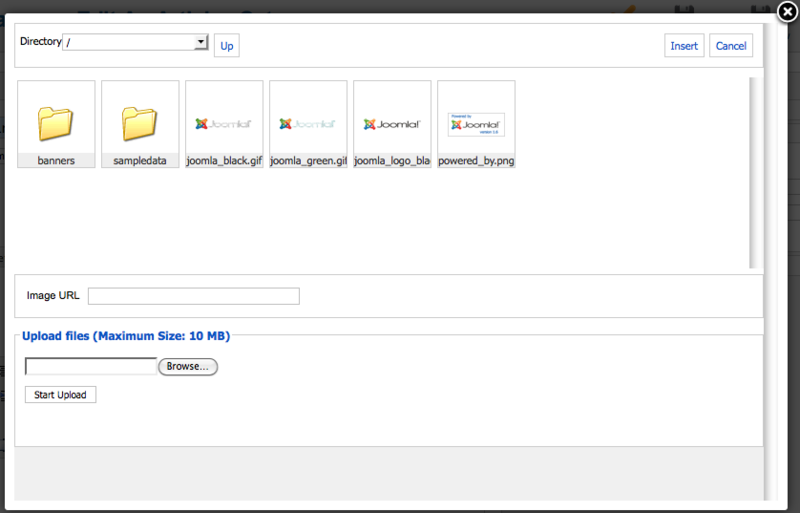 This is the 'images' directory under your Joomla! home directory. Use the drop-down list box to select a subdirectory. Up. Navigate to the parent directory. Note that the top directory for this function is 'images'. You can not navigate to a higher directory. Insert. Insert the selected image. The insert point will be the current cursor position. You will see the image display inside the edit window. Cancel. Cancel the operation and close the popup window. You can cancel also in clicking the X at right top corner. Thumbnail Browse Area. Click on an image thumbnail to select the image. Click on a folder icon to navigate to that subdirectory. Start Upload. Once you have selected a file, press this button to upload the file to the currently selected folder. The thumbnail for the new image will now show in the thumbnail area. This page was last modified on 30 April 2016, at 16:08.